Whether you are taking meetings for the first time or your have been taking minutes at meetings for years these tips should come in useful! Taking minutes at meetings is a very important task and meeting minutes are a record of what happened. For the people who attend the meeting and for those people that don’t attend they are very useful and very important. Have a look at our tips for taking minutes at meetings. Make sure that if you are at the meeting that you take clear notes. You are going to use the notes to make the minutes when you get back to your office after the meeting has finished. Your notes won’t be much help to you if you can’t read them. You also need them to be clear in case someone else has to help you and complete the minutes for you. If you have messy or uncompleted notes then you are going to find it very hard to complete your notes. Make sure that you have a good notepad and some spare pens – you don’t want to run out of ink when you are taking the minutes. Some people before to use a tablet or laptop to take the minutes, just make sure that you have enough power in your mobile device. It is always a good idea to have a pen and paper as backup as well. When you enter the meeting room you can check to see if there is a power outlet for your mobile device, if it a long meeting you might need to use the power. If you get chance before everyone leaves just have a good read through your notes to make sure that everything that you have put down makes sense. If you need clarification you can then ask someone before they leave the meeting. If you are unsure about a particular point then make sure you ask. You can ask during the meeting or make a note and ask at the end of the meeting. Just make sure that you have all of the information that you need to have a really good and clear set of minutes. If there are points in the notes that you are unclear about then make sure you ask someone who attended the meeting for clarification. If you are in the meeting and you are unsure then make sure you get clarification at the time. Common questions are things about acronyms, technical questions and clarifications on dates and times. Don’t worry about asking questions it shows that you are being thorough and ensuring that all of the details of the meeting are being covered. It is a good idea to prepare your minutes as soon as you can. the details from the meeting will be fresh and if you have missed anything from your notes you should still be able to remember it or ask someone else or was at at the meeting. When you are preparing for the meeting make sure that you put some time in your schedule for the days after the meeting to ensure that you can complete the meeting minutes and then send them out to the attendees. When you have finished your minutes make sure you have read through the meeting minutes for any errors. When you are happy with the minutes you then need to distribute them to the people who attended to the meeting. You might have a list of email addresses and some people might need to receive a copy of the minutes in the post. Make sure that everyone who was the meeting will receive a copy of the minutes. Make sure that you know the full names of everyone who was at the meeting. If you are attending a meeting at a new location make sure that you take a note of all the location details – you can add this to you minutes. If the meeting is being attended by people from lots of different organisations make sure that you take a note of the companies or organisations that they have come from. This is a small detail but makes a bit difference when you send your minutes out and can be a big help to the people who were at the meeting – remember some of them might not have met before either! Make sure that you have done your preparation before the meeting. Make sure that you have all the material that you need before the meeting – pen, paper, laptop. If you are travelling to the meeting make sure that you have enough time to get the meeting location on time. if it is the first time you have been to the location make sure that you know where it it and how you are going to get there. If you are attending a meeting on a subject that you don’t know a great deal about then you might find it useful to ask the meeting chairman for a brief summary about what the meeting will be about. If the meeting is technical then a quick summary might help with any of the terms that you are going to encounter during the meeting. As we noted earlier in the tips make sure that you have time to prepare the minutes and get them out to the attendees. You don’t want them to be waiting for weeks and weeks for the minutes to arrive. Give yourself a target date for when you will have sent the minutes out. 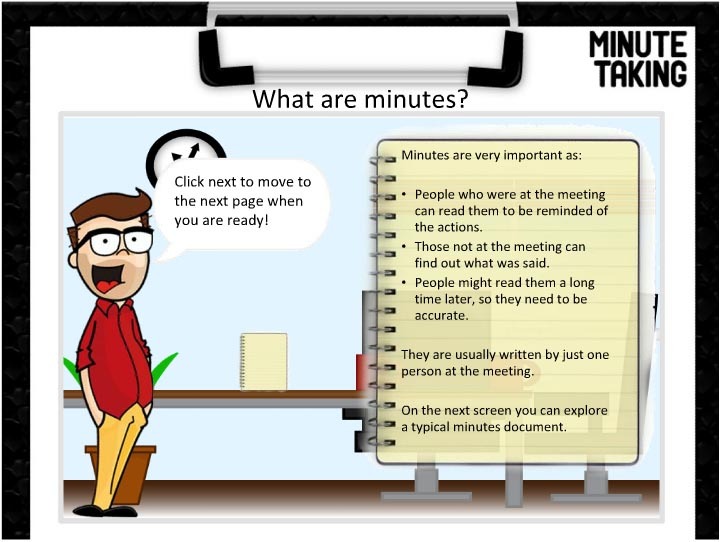 You might have your own minute taking tips, what you do when taking minutes at meetings? Do you use a laptop? Everyone will have their own set of minute taking tips but we hope that our set of tips will help you!